Scottish Labour is to launch its referendum campaign this week, setting out our distinct case for Scotland staying within the United Kingdom. 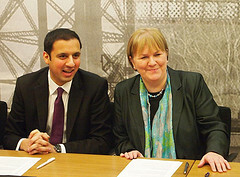 Johann Lamont and Anas Sarwar will be among the speakers at the launch of ‘United with Labour’ in Glasgow on Monday. The campaign will contact 500,000 households in the next three months and a mixture of senior Labour figures and new faces will be invited to put the case for Scotland standing strong within the United Kingdom. “We are excited about putting forward our case for Scotland in the United Kingdom based on Labour values of solidarity, community, fairness , equality and social justice. “Our vision is for a fairer, better Scotland that stands strong within the United Kingdom, working in partnership with our neighbours. “Constitutional politics brings together people who wouldn’t normally be on the same side and we will continue to work with the Better Together campaign. “But the Labour movement has a different view of Scotland’s future from the Conservatives and Liberals. The launch will be at the Emirates Arena in Glasgow.